Just two songs from Ampel’a, an exceptional musical collaboration between musicians of diverse musical heritage. Armenia and India, two countries with primitive musical tradition, meet for the very first time. 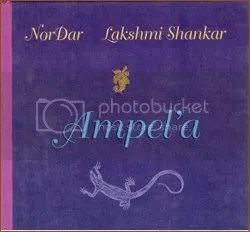 Kora Michaelian (member of NorDar) composes the music and nightingale of Indian classical music, Lakshmi Shankar sings. The album is a unique fusion of Armenian and Indian melodies, embossed with sophisticated musical forms.